Thai food as fusion food? Today, there is apparent confusion among some western chefs who are borrowing ingredients commonly used in Southeast Asian cooking to create their own blend of East-West cuisine, frequently referred to as “fusion” food. Little do they realize that many of the ingredients are not native to that region of the world, but have come from some place else, including the Americas. I am amused whenever I see a bottled sauce, or item on a western menu, being described as “Thai” just because it contains peanuts or a peanut sauce, but yet does not reflect the flavor balance that makes Thai cuisine what it is. Peanuts really are American, not Thai. 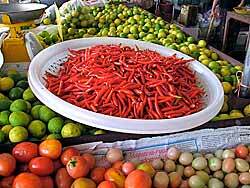 Although chillies are a beloved Thai ingredient and used intensively, they, too, are not native to the region, but are introduced from the Americas. Thai cuisine cannot even lay claim on its most essential flavoring ingredient – fish sauce, which really has roots in Mediterranean cuisine. The ancient Romans cherished this salty extract of anchovies and doused a wide variety of dishes with its flavor and aroma. 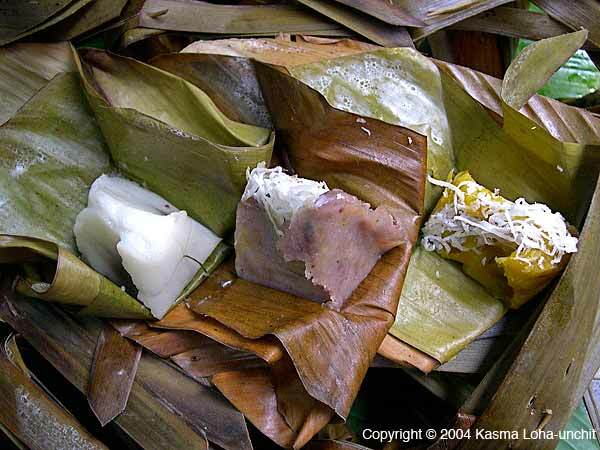 Aside from these notable examples, there are numerous other foreign ingredients, as well as styles of cooking, which have been absorbed into the cuisines of Southeast Asia. Thai food is already “fusion food” and is what it is not because of the individual ingredients, but because of the particular flavor balances that set the cuisine apart from others. Owing to the country’s auspicious location and her people’s openness, Thai cuisine has seen tremendous changes over the past few centuries. During the sixteenth and seventeenth centuries, booming international maritime trade brought a host of flavor ingredients and cooking styles from around the world, many of which made their way into Thai cooking via the nobility. On their long, circuitous journey, merchant ships sailing between India, the Spice Islands of the Indonesian archipelago and China would stop by the fabled ports of Ayuthaya in the kingdom then known as Siam. Ayuthaya was an amphibious city, situated on an island formed by the confluence of three rivers, and in its heyday supported a population of over a million, most of whom lived on houseboats along the rivers and their many tributaries. It was a glittering, very cosmopolitan and international city, described by some awed travelers as even more glorious than London and Paris of its day. More than forty nationalities at one time or another resided here, many occupying their own quarters in the city with their own docks. They brought with them ways of cooking from their homeland. Those involved in international commerce traded the spices and foodstuffs they carried on their ships. There was a great exchange of culinary delights and many new and unusual ingredients found their way into Siamese kitchens to be given a distinctly new identity. 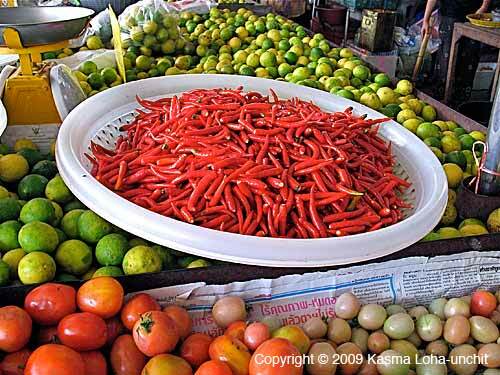 It was during this period when chillies were introduced into Asia, brought from the New World by the Portuguese. It took no time for them to become adopted and their extensive use continued through the centuries until now they are inseparable from Thai cuisine. 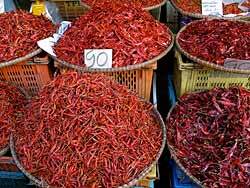 Prior to their arrival, the spiciest ingredient used in Thai cooking was pepper, in the form of white, black and green peppercorns, introduced by Indian immigrants in earlier times. Ironically, it was black pepper which led to the discovery of chillies, as Christopher Columbus sailed west in search for a shorter route to India to obtain this treasured spice in European cooking of his day. On that voyage, Columbus did not land in India, though he called the people there “Indians,” and did not find black pepper, though he called the fiery chillies there “pepper.” The rest is history. Aside from the lucrative international maritime trade, spices and flavor ingredients came in through age-old overland trade routes between the Far and Near East. Migration of diverse ethnic cultures at different times in history brought lasting culinary contributions as these peoples settled and became assimilated into the kingdom’s populace. Despite numerous foreign influences, Thai cooking developed on a course that firmly established itself as a distinct cuisine with its own unique combinations and balance of flavors. This development closely reflects the nature of the Thai people themselves, whose easy-going ways and adaptability to outside ideas combine with their resilient independent identity. Since the birth of the nation, Thai people have retained a special ability to hold on to their own unique, independent identity even as they accept and integrate foreign elements into their culture. Thai cuisine continues to evolve today as the Thai love for variety challenges innovative chefs to experiment with ever-new ingredients from around the world, blending them with native herbs and spices to create dishes that still retain a quintessential Thainess. 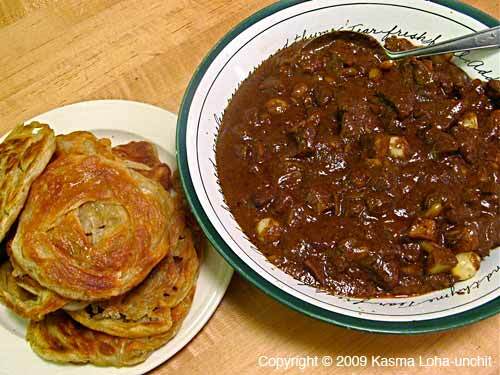 The cooking of ethnic minorities and of neighboring countries continues to exert tremendous influences. A large number of the ingredients used in Thai cooking have roots outside Southeast Asia, but have become fully assimilated into Thai cuisine and are indispensable in creating the flavor balances uniquely Thai. A version of this article originally appeared in Kasma’s second book, Dancing Shrimp: Favorite Thai Recipes for Seafood. Written by Kasma Loha-unchit, June 2009. 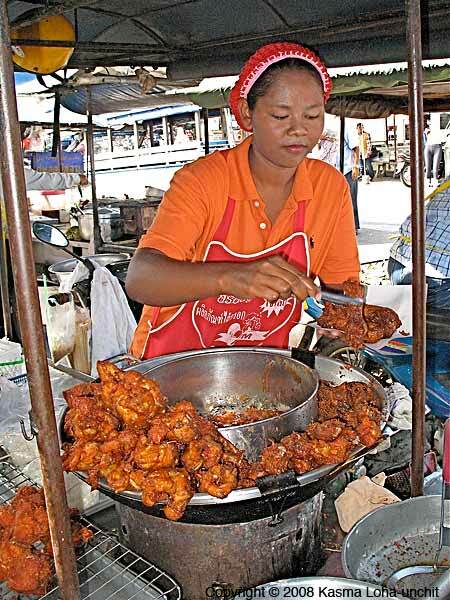 This picture shows a common sight in Thailand – a street food vendor with a very basic set-up: it can be relatively inexpensive to set up as a vendor. The picture was taken in front of a historical ruin in Ayuthaya. 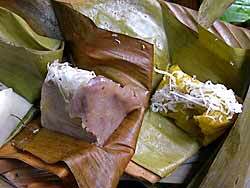 Sour sausage, in this case, Stuffed Sour Sausage with Sticky Rice (Saigkrawk Naem) is a fairly common street food. 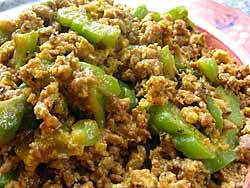 It’s a simple recipe – ground pork, cooked rice and salt, mixed, stuffed and left out several days to ferment. The vendor also gives you a bag of condiments to be eaten with each bite of the sausage, typically peanuts, sliced ginger, whole Thai chillies (prik kee noo) – you bite off as much as you want – and often cabbage. 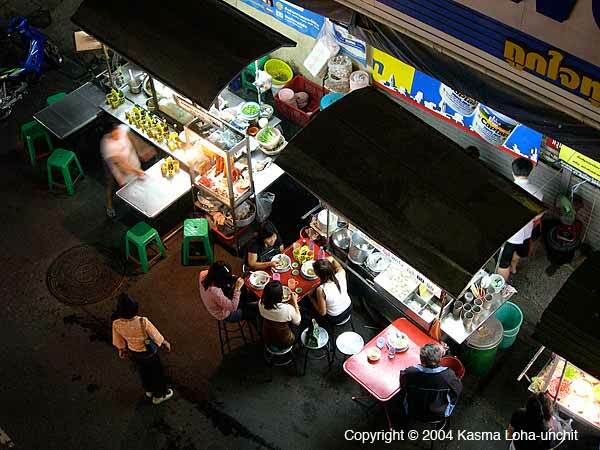 Kasma has blogged previously on street food: Delights of Thai Street Food. 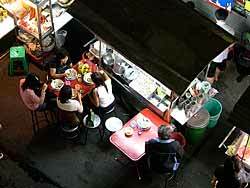 On our website, see One Soi’s Street Food Scene and Thai Fast Food: Crowded Sidewalks and Waterways. 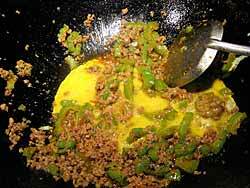 This recipe, Bitter Melon, Chorizo and Egg, is a variation on one of my very favorite recipes of all time – Bitter Melon and Egg – Mara Pad Kai. 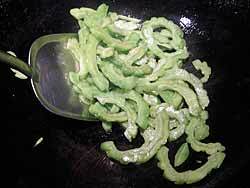 Admittedly, bitter melon might be an acquired taste, although I’ve liked it from the start. I make the Bitter Melon and Egg recipe frequently and one day as I was getting out the ingredients to make it, I happened to see a package of chorizo sausage and decided to add it into the recipe and see how it went. The chorizo I most prefer is bought from The Fatted Calf. It is a Mexican style chorizo (loose sausage, like hamburger) made from pasture raised pork, organic garlic, red wine vinegar, organic herbs, sea salt and spices. It is very good. That’s what I used in the recipe. The recipe is simplicity itself. After cutting the bitter melon in half lengthwise and taking out the seeds, I cut it (diagonally) into slices. Before cooking I took the sausage out of the package and beat some eggs lightly. Then I heated up some lard in a wok (lard is a marvelous oil for stir-frying), cooked the bitter melon a bit until it began to turn a little bit translucent, added the chorizo and cooked it until the sausage was almost cooked, then added the eggs and cooked until done. From start to finish can be about 10 minutes. Serve over rice, if you want a starch, but with a good chorizo, the dish is good enough to eat by itself. I’ll include a more formal version of the recipe below but it’s so simple you really can just wing it. For tips on buying bitter melon, read Kasma’s Notes and Pointers from her Bitter Melon and Egg recipe. Feel free to vary quantities any way you’d like. The pictures I’m including here actually used a pound of chorizo to one bitter melon and I used three eggs. If you like it with chorizo, try it with another loose meat or sausage. 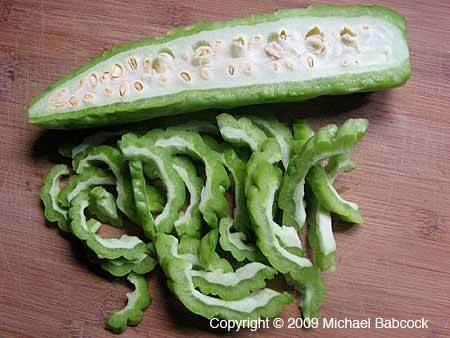 You might also enjoy Kasma’s article on Bitter Melon on the website. 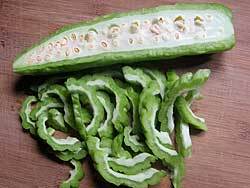 Cut the bitter melon in half lengthwise, remove the seeds and slice each half crosswise in thin pieces. Beat the eggs in a bowl. 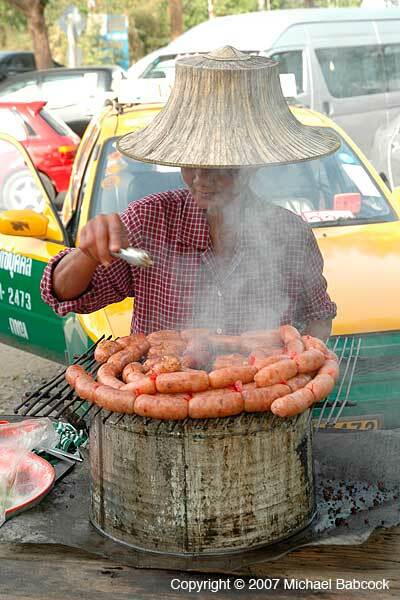 Heat a wok until its surface begins to smoke. Swirl in the lard or oil and let heat 10 to 15 seconds. 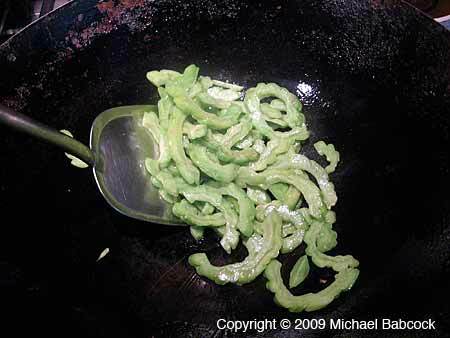 Add the bitter melon and sauté in the oil for about one minute. If needed (this will depend on your chorizo), sprinkle with fish sauce and continue to sauté for another 1 to 2 minutes, or until the melon starts to soften. Add the chorizo, break up so that it is loose, toss amongst the bitter melon and cook until nearly done (1 to 2 minutes). 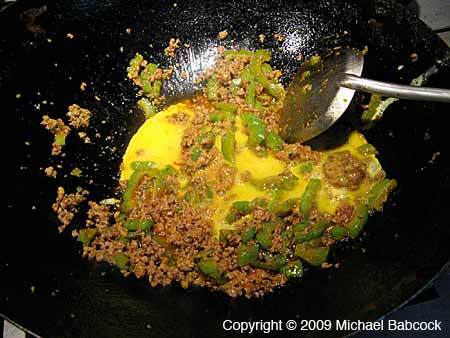 Spread the mixture thinly over the wok surface. Pour the beaten eggs evenly over the melon pieces. Let eggs set about half a minute, then flip the mixture over to cook the other side. Cook until eggs are set and lightly browned. Yup. 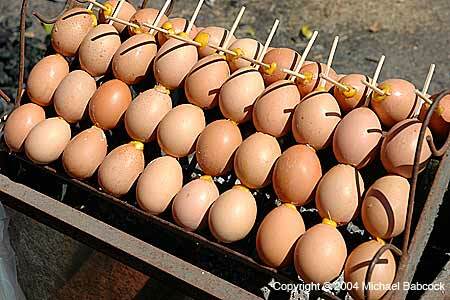 They are grilled eggs, in the shell, skewered. I’ve never tried them but will one of these days. 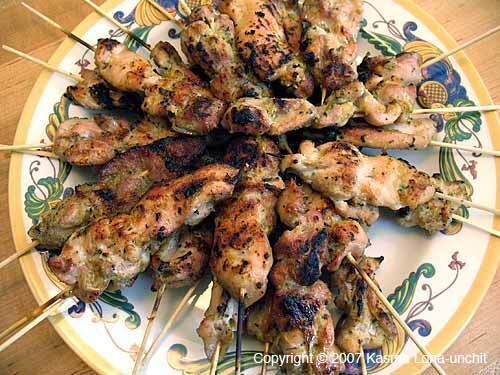 Last week’s Wednesday Photo featured Food On a Stick. This week shows more food on a stick, in this case a somewhat unexpected food. You never quite know what you’ll see in a Thai market. 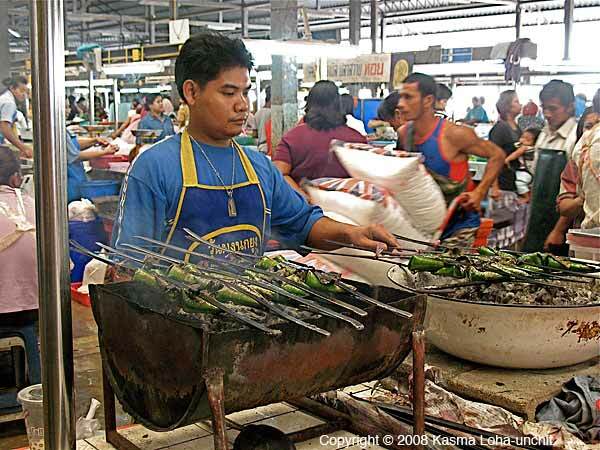 “Thailand is one big open-air kitchen!” exclaimed a friend and cooking student as he summed up his impression of a country so overflowing with an abundance of street and market foods. Indeed, for the curious and the adventurous food-loving traveler, the festive ambience and irresistible sights and scents of foods of all description, cooking to perfection along the sidewalks and in bustling open-air bazaars – and even on wooden boats paddling around canals – stand out among the most lasting memories. 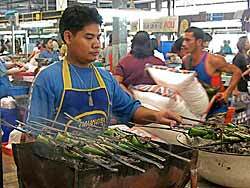 Feasting one’s way around Thailand is a very easy thing to do, even for someone on a shoestring budget. The only requirements are an adventurous spirit, courage to disregard health authorities back home and a good sense of judgment to make wise selections from among an overwhelming number of vendors and hawkers. Foods hot off the grill, frying pan or steamer, wrapped and roasted in leaves, cooked to order in boiling hot broths, or tossed in woks surrounded by leaping flames, are surely safe to eat. Plenty of garlic and chilies serve as natural antiseptics and, when you do get the occasional run and tummy ache, drink plenty of refreshing coconut juice and munch on the creamy flesh of fresh coconuts, which work wonders in returning your GI tract to normal. Your rewards are heavenly delicious morsels enough to make you sweat with pleasure and a dose of soulful appreciation when the exchange is consummated with a smile of content. For nothing can endear you more to the people of this land than your willingness to try and your ability to partake of the same foods they do. Besides, sitting on rickety stools at worn-out tables, shaded by brightly colored tarps or oversized parasols, immerses you in the very heart of everyday Thai culture. It’s a great setting to people-watch, to mingle and rub shoulders with natives from all walks of life and, perhaps, to strike up a friendship of a lifetime. At the same time, you are entertained by dramatic cooks and may even gain a precious cooking lesson at no extra charge. The invigorating atmosphere, the piping hot food exuberant with flavors, the mouth-watering aromas and much more, add up to an exotic experience you won’t likely forget for a long time to come. 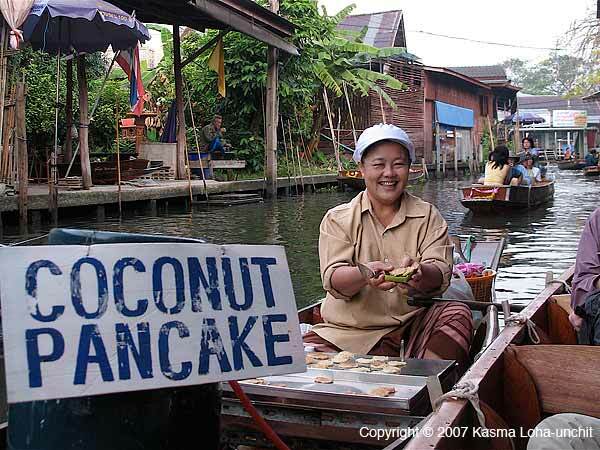 Indeed, on one of the travel groups I led through my homeland, seventy-five meals and countless snacks later, one woman insisted that the most memorable dining experience in her life would have to be the extended breakfast we had at one of the rural floating markets. That meal started off while we were being paddled around in a small wooden boat, gliding from one boat vendor to another, sampling sweet and savory coconut rice hotcakes, fried bananas, grilled pork on skewers, grilled coconut pancakes, pan-fried mussel cake and leaf-wrapped and taro-stuffed sticky rice roasted over charcoal. Those were just the appetizers for this early morning nibbling affair. 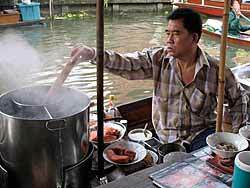 Later, we sat on low wooden stools on the steps of the boat landing, slurping on hand-held bowls of hot-and-sour noodles, while watching the noodle maker in the wooden row boat churn out effortlessly one bowl after another of delicious noodles. In the background, colorful boats hawking fresh seasonal fruits and vegetables and a tempting array of other snacks paddled by endlessly to complete the picture. Just as if all that wasn’t enough, later the same morning, we stopped by another town with a wonderful open-air marketplace. Stalls upon stalls offered up, among other things, sensational sticky rice roasted in bamboo, lusciously sweet jackfruit, crispy grilled pork chips, spicy fried fish cakes with cucumber relish, exceptional pork-stuffed dumplings, superb duck soup noodles, tasty grilled turmeric chicken, perfect golden ears of charcoal-roasted corn and marvelously nutty fried grasshoppers. She only wished she had a stomach large enough to sample them all! 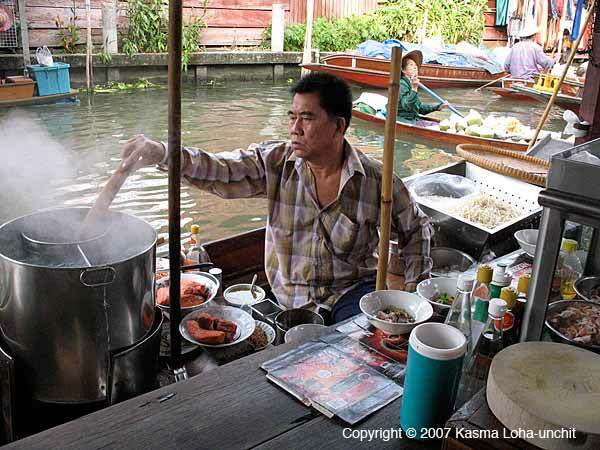 Though the numerous meals we had at many fine restaurants were exquisite and beyond comparison, it was the delightful experience of eating our way along the streets, canals and marketplaces of Thailand that stood out the most and was preserved in more than its share of colorful photographs – of both the extraordinary food and the smiling faces of the Thai people. So, on your next trip to Thailand, don’t just curiously walk by the countless street and market stalls without succumbing to sweet temptation. After all, Thailand does have cleanliness standards higher than many other developing countries. Use your discretion, be a true gastronomic soldier always ready to eat and have an experience of a lifetime! Our website has some articles on street food. 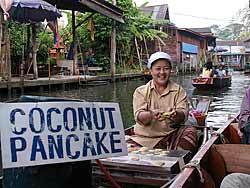 Check out One Soi’s Street Food Scene and Thai Fast Food: Crowded Sidewalks and Waterways. 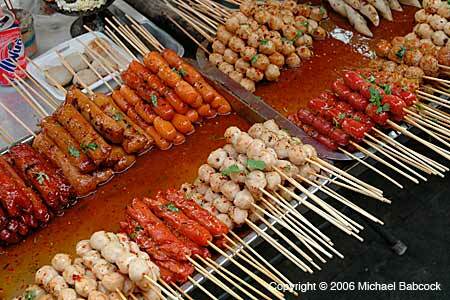 Nearly every Thai market or area with street food has a stall with food on a stick for sale. 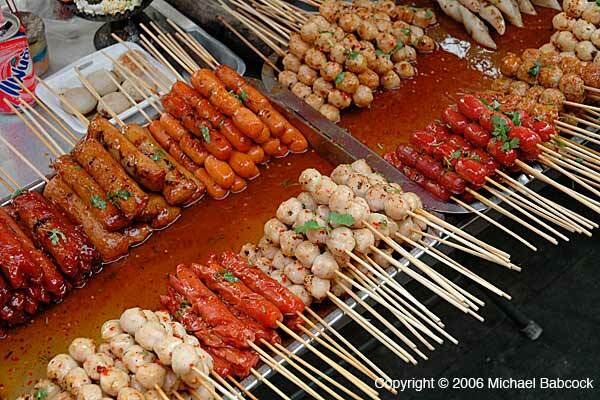 Our very first Blog entry, The Other Side of Thai Food, included a picture of wieners and little kitty faces on a stick. The above picture shows a fairly typical selection – it includes hot dogs, various fish balls (in many forms), pork sour sausage (there are at least two kinds above) and more. You’ll also see more specialized stands, such as one that as squid on a stick or (check back next Wednesday) eggs on a stick. You are currently browsing the Thai Food and Travel Blog blog archives for June, 2009.